Yesterday, I attended yet another toy train auction and added a Bing #1 gauge live steam engine to my collection. It was either very skillfully restored or never fired. I searched all my books and I "think" it matches one made for the British market in 1912. Any additional information much appreciated. Unlike my other live steam locomotives, it is unlikely that I will operate this example because it is just too nice to risk scorching. Very nice Eric! Can't help on the identification, but this looks to be a piece with some history. Oh, that is super SWEET!!!! Love it! Paging ARNE. NICE find at any rate. It is listed as Gauge 1. What doesn't match is the engine number nor the tender lettering. 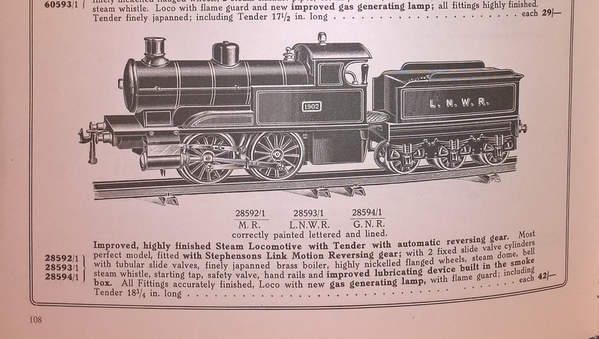 The 1 gauge engine on the next page of the 1912 catalog does have 3410 but it doesn't look anything like your engine. Both this engine and the one with 3410 have the same notations concerning correct painting, lettering and lining. Thank you for the information! Disturbing that the cab numbers are not a match and no road name on the tender. It is hard to believe that someone would invest the time and money to restore this and make such an obvious mistake. Barring further information, this will remain a mystery, but I like it nonetheless. 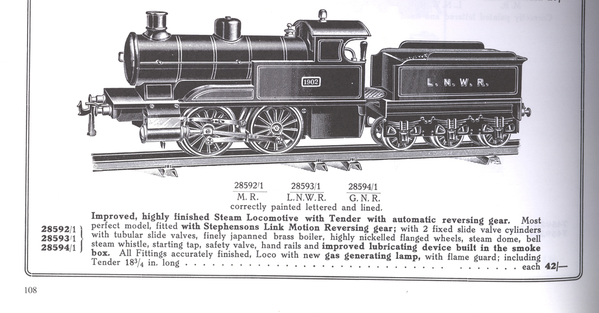 The 3410 number appeared on some locomotives of the "Bing for Bassett-Lowke" brand. Maybe it's related. A VERY NICE engine regardless of its origin and lettering/numbering conundrum! RSB came through first. The knowledge on this Forum is impressive! Very nice model Eric. As you explain it's a Bing made for the British market and bearing the 1924 logo on it's front. It seems to be, for me, all original and a generic model for Great Britain. With such a nice condition piece I would not fire it, too many damages could be done to the paint, you are right. I will try to search later for the exact reference of that beauty. A fantastic find! Apart from a lack of company lettering, the livery is Great Western Railway, so I would agree strongly with Daniel about it being a generic version for the UK market. I know that Bing trademark is post WW1, but if anyone could pin down the date, I'd love to know. 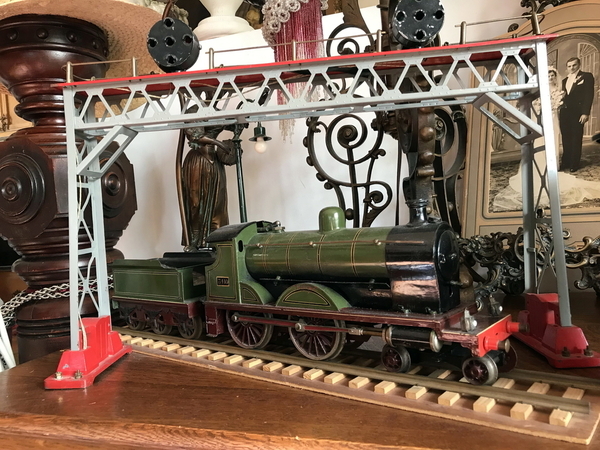 I know it was used on the earliest Bing table railway items from 1922, and I've also read elsewhere that it was introduced circa 1919, but sometimes a little mystery is all part of the allure of train collecting. I agree almost completely; I think however toy and model trains were made to run, so I would certainly fire/run it if it was mine. I agree with the concept that toy trains are meant to be run, but this is more than just a toy train. It is a historical artifact. If indeed it is original and has never been run, then I would vote (if I had a vote) to not run it for the preservation of history. I don't have a vote, so it really ends up being Eric's decision. Either way, it is providing the enjoyment that it was intended for. Oh, and I do love watching videos of Fred running his live steam beauties on his garden layout. FRED has a great multi-gauge outdoor layout, and whether he is running clockwork, electric or live steam, it is ALWAYS entertaining! Very nice locomotive. Good luck whatever you decide to do with it. In the description above it mentions a "finely japanned brass boiler." I had never noticed anything like that if Robert or anyone else can explain. Intricate detail??? Apparently, it has to do with the quality of the paint finish. Tom, It is lackered paint as old japanese furniture who have varnish in the paint and after another (in fact several) coat of varnish to geave a smooth finish. A big thanks to all of you for your interest, information, and opinions! Fortunately I own a few other live steam locos that were "pre-scorched" prior to my ownership. I do occasionally operate these on my friends multi gauge outdoor tracks. However tempting, I do not intend to operate the newly acquired Bing. Any additional information about the Bing would be much appreciated. 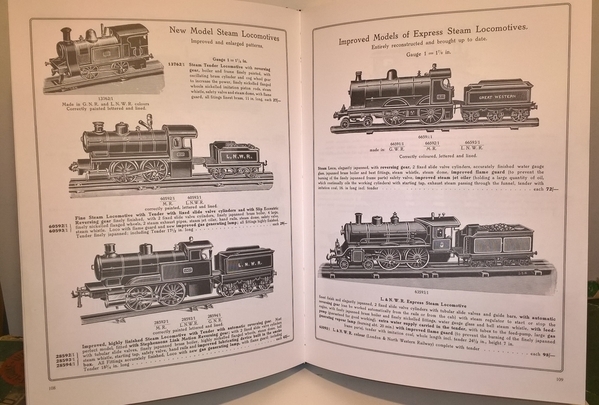 Eric, when I get a chance, I'll dig out the various reproduction Bing catalogues I've got, and take some pictures, I'm sure this loco features in a few different places, such as the New Cavendish reprint of the 1912 British market catalogue, and the various Verlag Eisenbahn books of Bing catalogue reprints. The only reference I could find is in the New Cavendish reprint of the Bing catalogue for the British market for 1912. 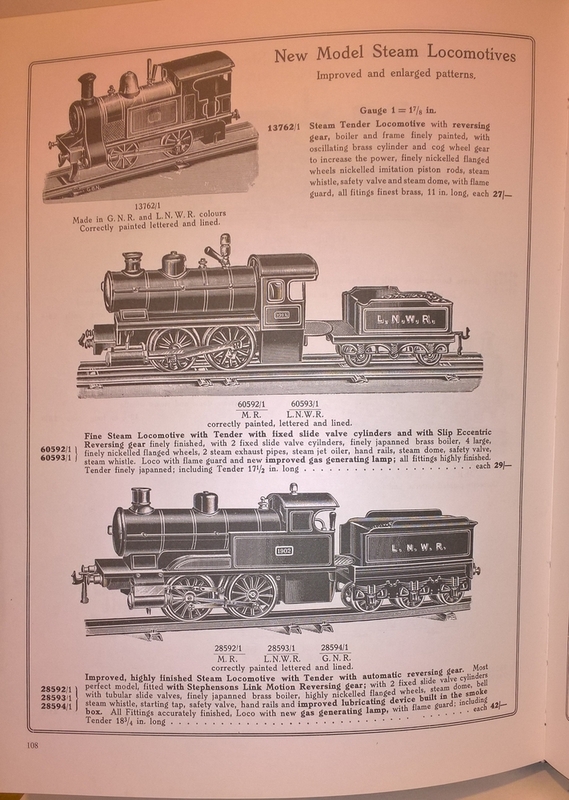 Seems odd, as Bing made this loco pre and post WW1, but there is a gap in known Bing catalogues from about 1915 to 1925, which is JUST where we would be interested to look! No mention of Great Western Railway livery in this catalogue for this loco, but the Bogie Express on the next page is, stuff like this varies over time, with little discernable explanation after 107 years! This is much appreciated. Thank you Mark! Undoubtedly very unlikely to find another hundred-year-old piece of art in this condition. I would enjoy it just by admiring and researching it. Just remembered, this was brought by someone I know at a UK auction back in February, other than the crackle to the varnish, it's amazing! And another post WW1 example, note the later trademark in front of the smokebox door. Only thing you could say about it was someone in the past has changed the couplings from Bing ones to Carette ones. That looks to be the same with the exception of the color, number, and couplers. The varnish on mine is also crackling. Bing were fond of using the same number on locos from the same company, so there are lots of LNER locos numbered 504, LMS ones numbered 513, GWE ones get 3410 all the time, LNWR are often 1902, and Midland Railway commonly 2631. Others turn up, but if Bing used a number on a loco once, they always used it again.